Some dishes have been around for a hundred years or more, in pretty much their original version. The flavor(s) of ice cream, and the number of flavors. The shape (bombe/dome [photo #2], loaf). Whatever the shape, it is then coated with meringue, which acts as an insulator so the ice cream can be baked without melting. These days, the meringue is torched to brown it. It is often plated with a fruit coulis: passionfruit, raspberry, strawberry. But those are just modernized flavors. The expansion of the original concept is more in shape: Baked Alaska cupcakes, Baked Alaska layer cakes, Baked Alaska nestled in empty orange or grapefruit halves or shaped into a shih-tzu or a sofa. 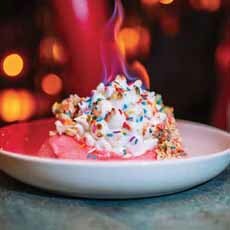 Komodo’s deconstructed Baked Alaska (photo courtesy Komodo Restaurant | Miami). Classic Baked Alaska at The Oceanaire in Dallas. And sometimes, between the layers, chopped nuts, fruit, what-have-you. Komodo restaurant in Miami has deconstructed Baked Alaska, assembled in individual portions (not a cake): photo #1. 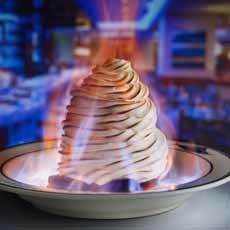 The Baked Alaska is ignited at tableside, drawing oohs and ahhs (or perhaps, “Epic!”). It’s easy to create your own deconstructed Baked Alaska, a.k.a. ice cream on a slice of cake with a meringue topping. Just pick your cake and ice cream flavors. Garnish optional; we prefer, simply, a very browned meringue and a fruit purée or coulis (coulis [COO-lee) is a strained purée). We combined a slice of carrot cake loaf with salted caramel ice cream, homemade meringue (although we suppose you could substitute meringue cookies), and raisins marinated in Grand Marnier as the sauce. The important thing: Have fun with it.